I have AIDA64 set to check for new versions, including betas. I received your mail-outs regarding v5.7 yesterday and today, but I had to manually download the latest 5.7 version. 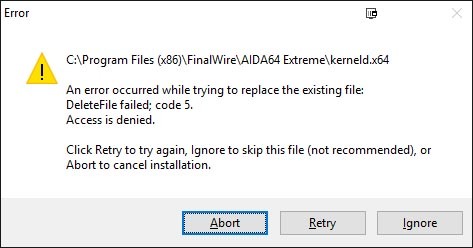 After downloading the new version, I exited AIDA64 and started the install, but got the following error. I suspect it may be related to Windows Services. I then turned off auto-start with Windows and rebooted... install went fine. Check for new versions is performed at the highest rate of once per 24 hours. If the last check was performed e.g. 6pm yesterday on your system, and you start AIDA64 8am this morning, it won't check for new versions and so you may be "stuck" with the previous version for a few hours If you started it 8am tomorrow, it would have noticed the new version and enabled you to update to it automatically. BTW, you can always initiate the check for updates process from the Help menu. I suppose AIDA64 wasn't closed properly now or sometime in the past on your machine, and that left the old AIDA64 kernel driver loaded by the Windows service layer. Restarting the computer helps in such cases.